You have customized the menu bar of the new Office versions and have added personalized functions to it. You now want to save this confi guration or want to transfer it to other computers. You can export individual settings of the menu bar to a file. This is done separately for each Office program. Select ‘File | Options’ in Word and select the ‘Customize Ribbon’ option. Click the ‘Import/export’ button in the lower right of the dialog and ‘Export all customizations’. Navigate to the desired folder and retain the suggested file name ‘Word Customizations.exportedUI’. Clicking ‘Save' saves the adapted configuration in a separate XML fi le, which is loaded at the time of each start. You can also load your configuration on another computer or reload it after a reinstallation using ‘Import settings fi le’. For this, open the relevant file of type ‘exportedUI’, answer the security query, and overwrite the menus. NOTE: This backup does not include macros that have been personalized and saved for buttons. You thus define only the necessary command call-ups. 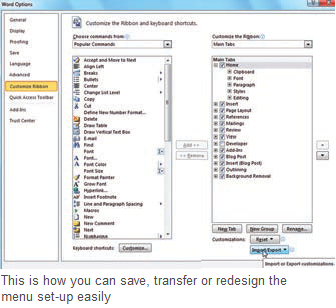 Macros must be separately saved and transferred.